The EL 150 Aluminum garage door is a frameless looking glass and aluminum door that is revolutionizing the Los Angeles custom garage door industry. Elegant Custom Garage Door & Gate were one of the first companies to design, and install these high end contemporary looking custom garage doors. Sporting a modern, sleek, and stylish look the EL 150 Aluminum consists of usually mirrored or opaque glass panels that are seamlessly attached to a fully aluminum frame. This gives the whole door a thoroughly contemporary and modern look, that is hard to beat, and will add instant curb appeal once fully installed. With sales of the EL 150 Aluminum custom garage door soaring, we are now Southern California’s market leader in supplying these ultra modern garage doors to residences all over Los Angeles. Choose your Full View Frameless options. 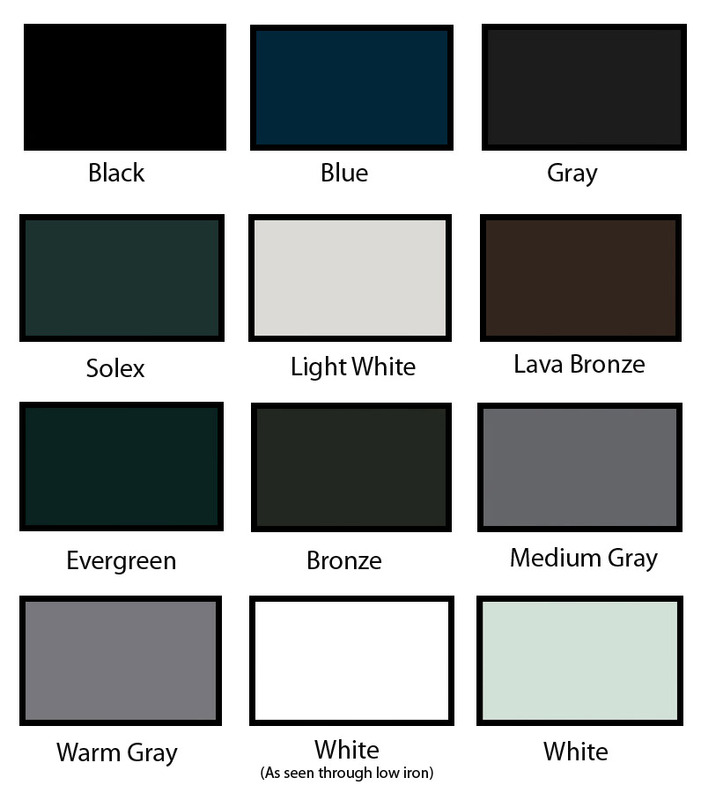 We have a large assortment of Opaque colors, everything from blue and evergreen to a traditional white or black, to make your new door look spectacular. Choose between Reflective Bronze, Reflective Gray and Reflective Black for a tasteful Translucent glass coating. Finally choose one of our frame finishes. If powdered coat is your preference, we have a traditional white coming soon. Or you can select from any of our three anodized options: black, dark bronze and clear. Top rail width - 4-5/8"
Bottom rail width - 4-5/8"
Combined intermediate rail widths - 4-1/4"
Center stile width - 2-7/8" End stile width- 4-5/8"
Glass Size Capabilities: Three options of glass thickness available 1/8" / 1/4" / 1/2"
*Please Note: All glass is tempered except for laminated options. *Please Note: 11 gauge components and 3" steel 10 ball bearing rollers will be used when specified. 25k, 50k, 100k cycle springs are available with an additional cost. Limited 2 year warranty against cracking, chipping and or fading of the anodized or powder coat finish; limited 1 year warranty on hardware and components.